In other words, for enjoying music, Dispersion of wave form is more or less essential, otherwise music becomes dry-sounding and thin like a orchestral performance in a open field. This means, when we listen to music through audio equipments, played-back sound should be comprised of proper group velocity components through out the frequency spectrum of the music wave forms. As you can notice in many occasions that sound character of music in each concert-hall or studio has strong individuality. This means that each hall or studio has its own individual dispersive character of the acoustic space inside there. Dynavector SuperStereo processor DV SSP-5 can develop the group velocity components from the music signals which is recorded by microphones, and control the magnitude and character of group velocity distribution throughout the entire frequency range of the music. Listeners can tune to the best condition to match the reproduced sound character with the music you want to hear by selecting a switch position from four push-switches which represent four typical dispersion characters. You can do this by a remote controller from the listening position. 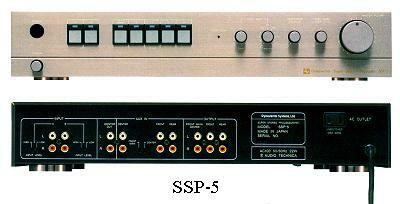 Balance between front, middle and rear can be adjusted to the listeners preference by manual control of two balance knobs on the front face of SSP-5.